Here's one of the QRS shades I ordered recently, and I think it works nicely as a top coat. It's called Glittering Rainbow, and it's packed full of tiny multi-colored holographic glitter in a clear base. I used one coat over Jessica Purple Burst. Above & Below: The top picture was photographed outside under partly cloudy skies, and the photo below was taken using a flash. The last photo is with no flash taken indoors. 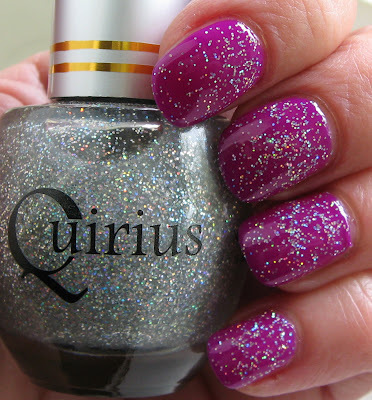 This polish is similar to many others I have--INM Northern Lights and Orly Shine On Crazy Diamond come to mind--this one covered well and dispersed the glitter evenly across the nail. The glitter changes color with movement, and I think the name of this polish is very fitting. Hi Mary. Wow...I just got done looking at some of your other posts. Such gorgeous colors from Jessica,and China Glaze's Vixen collection looks promising. This silver glitter looks beautiful layered. Nice way to jazz up a creme polish. That purple is super pretty! Reminds me of Essie perky purple from their summer neons last year! Nice topcoat! Perfect for adding just a little sparkle and bling! Pretty as a topcoat. I also have many others like this. Phyrra~I do have lots of top coats like this, but I still love looking at them! Amy~yes, it's not "too" much and adds just the right amount of mild bling! Lucy~I know, me too. But yet I keep buying more!